The land of historic farmers’ uprising of Pathorughat, Darrang district on Wednesday once again created history in the field of agriculture when the district launched facility of purchase of IFFCO (Indian Farmers Fertilizer Cooperative Ltd) fertilizers by the village farmers with the help digital marketing in a transparent, hassle-free manner through different Common Services Centres (CSCs) functioning in different rural areas of the district. The innovative scheme conceived for the first time in India has been launched ceremonially by the Deputy Commissioner, Darrang, Ashok Kr Barman in a public function organized at the Assam Club auditorium in Kharupetia by the Darrang district administration in collaboration with the Darrang CSC authority. In his inaugural speech, Deputy Commissioner Barman outlined this unique project as the result of the Prime Minister’s Digital India campaign of expanding and outsourcing large number of public utility services through the rural CSCs and Village Level Entrepreneurs (VLE) and urged upon the local farmers, particularly of Kharupetia, which is known as the hub of vegetable farming in Northeast. He also appealed to the farmers to avail of the opportunity of the new project and at the same time use chemical fertilizers in a judicious manner. Earlier, while explaining the objectives of the project, Pankaj Chakravorty, Additional Deputy Commissioner in charge of IT and District e-Governance, Darrang underlined how the project, the first of its kind in the country, with proper implementation can bring a sea change among the farmers’ community of Kharupetia in particular and Darrang in general by reducing the alleged practice of black marketing and middle man culture in the existing fertilizer marketing system and improve the mechanism for the benefits of the progressive farmers. He also highlighted various online services like medical consultancy, consultancy over animal husbandry, insurance, etc. which can be easily availed through the nearby CSCs. 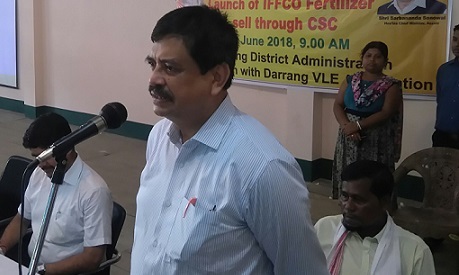 The inaugural ceremony ended with a vote of thanks by Jhanjhashri Sarkar, in charge of Digital Literacy Cell, Darrang was also addressed by Yuvaraj Borthakur, Revenue Circle Officer, Dalgaon; Nila Kanta Deka, District Agriculture Officer, Darrang; Jnan Doley, Head of CSC, Northeast; Islamuddin Ahmed, BDO, Besimari and Deborshi Bag, Marketing Head, Northeast among others. The function was also attended by around three hundred farmers, VLEs and village heads, etc.